Engineered for the latest Android based smartphones, tablets, action and MIL cameras. Recommended all smartphones, tablets, action cameras and drones. Shoot continuous burst mode, Full HD and 4K Ultra HD video, up to 100MB/s transfer speed. Capture more fast action and record more Full HD or 4K Ultra HD video (1) with your Android based smartphone, interchangeable-lens camera or GoPro action camera. 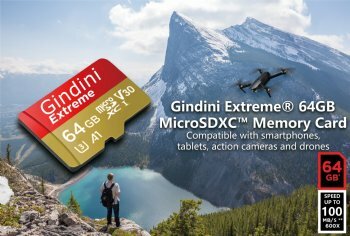 The Gindini Extreme microSDXC UHS-I Card is built tough for extreme durability under challenging environmental conditions (5). Extreme speeds let you capture every detail of adventure and take the wait out of transferring your videos between devices. A storage capacity of 64GB (2) expands your device's memory and lets you record 4K Ultra HD video. Gindini products are constructed to the highest standards and rigorously tested. You can be confident in the outstanding quality, performance and reliability of every Gindini product.